A clear and immediately engaging explanation of the truth: Lexiles alone do not tell the story. Thanks, Fran. The whole notion of matching texts and readers is complicated if one desires a number or a formula to do the work. However, it is simplified by handing a book to a student or reading part of the book to a student! Thanks for this great post! Lexiles are so misleading! The middle school ELA teachers and I went through the process of using the qualitative rubric to evaluate The Book Thief. We were in complete agreement that this is a complex text that we only consider using with 8th graders. But when we checked the lexile, we were flabbergasted to discover that its lexile is 730. “Out of whack” for sure! We all agreed that using the rubric was a useful, if time consuming, process. We also decided to trust our judgement and not to make decisions based on lexiles levels alone. Wise choice not to use “lexiles” alone! You are correct in thinking that Book Thief is complex and an 8th grade placement has been confirmed by other teachers. 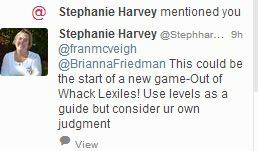 I love Stephanie Harvey’s “Out of Whack” phrase! Then my brain goes to that silly “Whack a Mole” game and of course, I am just laughing out loud. I appreciate your comment! Keep up the good work because you are on the right track! Thank you, Fran! A good primer on Lexiles to teachers in search of a text! I spoke at a Common Core Conference in June and while there, sat in on a informal presentation by Malbert Smith, developer of the Lexile Framework and MetaMetrics President. He shared with us that one of the most distinguishing aspects of the algorithm determining Lexile ratings was the appearance of rare words in a text. So while many think it is about word and sentence length, it is really about the frequency of a word in a corpus of 6 million words used by the analyzer. Semantic difficulty paired with syntactic complexity determines Lexile levels. The reason novels are relatively low in the Lexile ratings is because they contain dialogue which is usually comprised of conversational language and not rare words. In a bit of fun, he shared some very short words with us and showed how quickly their inclusion can change a Lexile rating. Good stuff to know. You are welcome, Dea, and thanks for your comments! The examples Malbert offered were Tier 2…but let me see what I can find out! Great explanation of misleading lexile levels – we must use caution when referring to those conversion charts. Thanks for your comment, Anna. This is also why it is so critical that teachers, administrators, and community members KNOW exactly what the Core says. It is too easy to rely on others without checking the facts/ evidence! A year later and it is still a battle to make people understand you can not teach from Lexile alone. Now that the school is “graded” based on how many students read at a certain Lexile level at a certain grade level, the battle is almost unbeatable. Almost. 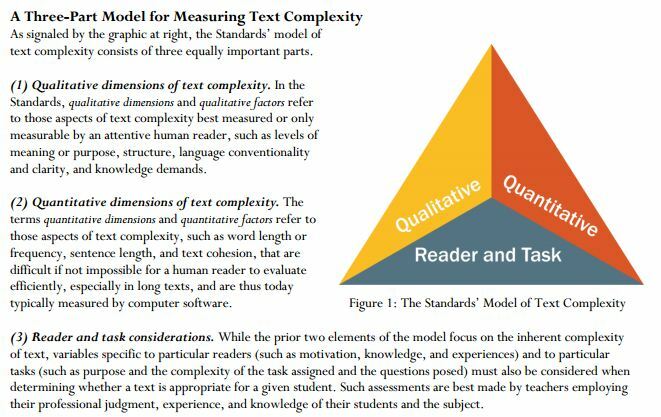 It’s amazing that a “three-sided” approach to text complexity can be reduced down to a Lexile level. Keep fighting the good fight as that is NOT what the Common Core says nor what was intended! Have you ever gotten an answer on HOW Lexile is determined from the standardized test? How do they calculate a child’s Lexile based on the test score? I’ve asked. I’ve researched. There are theories but no real “this is how we do it”.